The story of this post actually begins over a decade ago. In 2002, Pete and I began attending the same church as Pete's parents and grandparents when we moved back to Oregon after university (and we attended this church until we moved to Luxembourg in 2012). Pete's parents and his grandma had joined the fantastic choir, and we both decided to join too. The choir was planning a trip to Europe for the early summer of 2005. We had assumed we wouldn't go along, but we were somehow cajoled into helping out at the variety show fundraiser for the trip. It was a February-Valentine-Love-themed show, and as two of the youngest members of the choir, we were assigned to represent "young love" with a scene and song from The Fantasticks. A sucker for musical theater, I was game, but to this day I have no idea how we convinced Pete. one of the last known photos of Pete with hair, February 2005. Well, we were sort of a hit. I'm not sure of the exact sequence of events that followed, but I remember that various folks in the choir began trying to convince us to come along on the trip. Between being a young married couple still getting our bearings financially, and then finding out we were expecting our first child, it hadn't seemed practical. But with some persuasion, and also a scholarship to help with the expense of the trip, we were (literally) on board! Pete and I had previously visited England to introduce Pete to my mom's side of the family right after we got married, but this was our first trip to continental Europe. 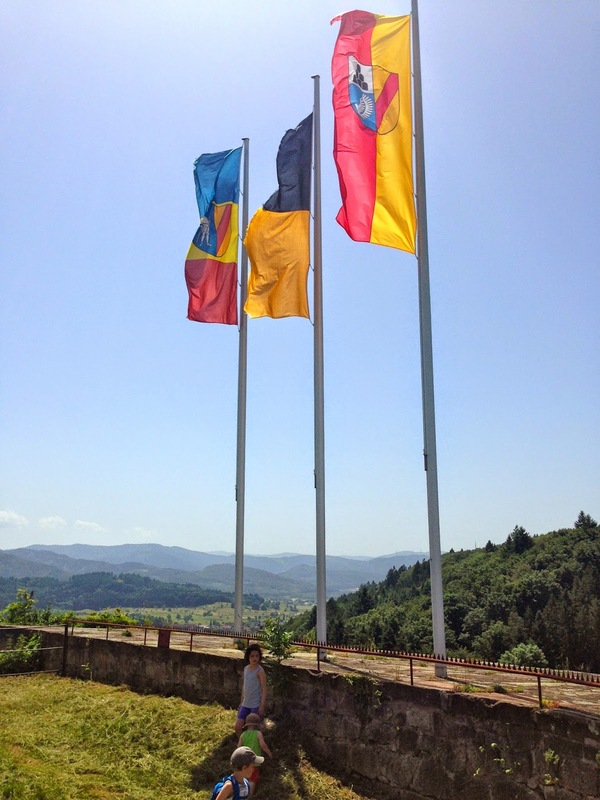 We spent time in France, Italy, and Austria. It was great fun to travel with the choir, plus Pete's mom, dad, and grandma! However indirectly, Pete and I have always considered that 2005 trip as part of our journey toward residing in Luxembourg, mostly because it gave us our first impressions of continental Europe. We liked it. Anyhow, fast forward 9 years to the present day. The same choir was planning a second trip to Europe, this time in France, Belgium, and The Netherlands. Pete's parents were coming along again, and his mom was part of the planning committee this time. When the committee was researching organizations to help in Europe through holding benefit concerts, they made a connection with the founding chapter of Serve the City in Brussels, Belgium through some friends of ours at our church here in Luxembourg. 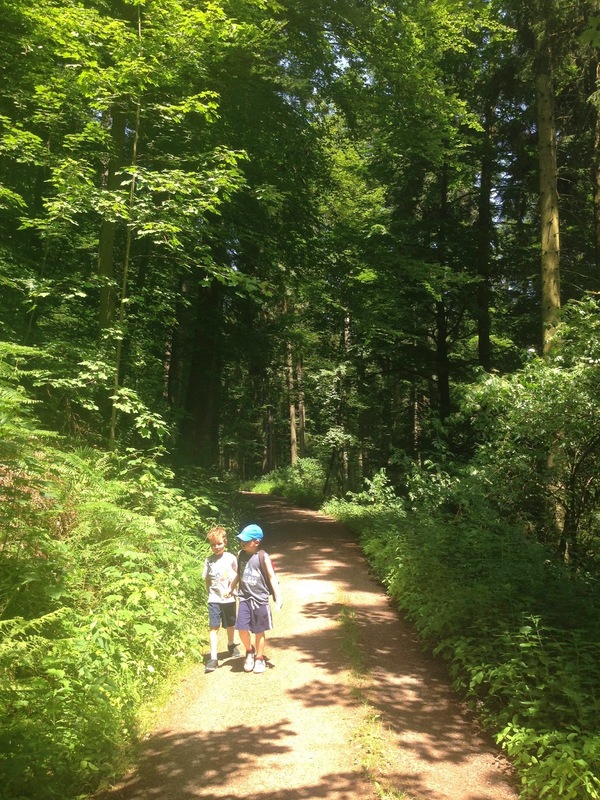 These friends recently started a chapter here with the help of our church in Luxembourg. 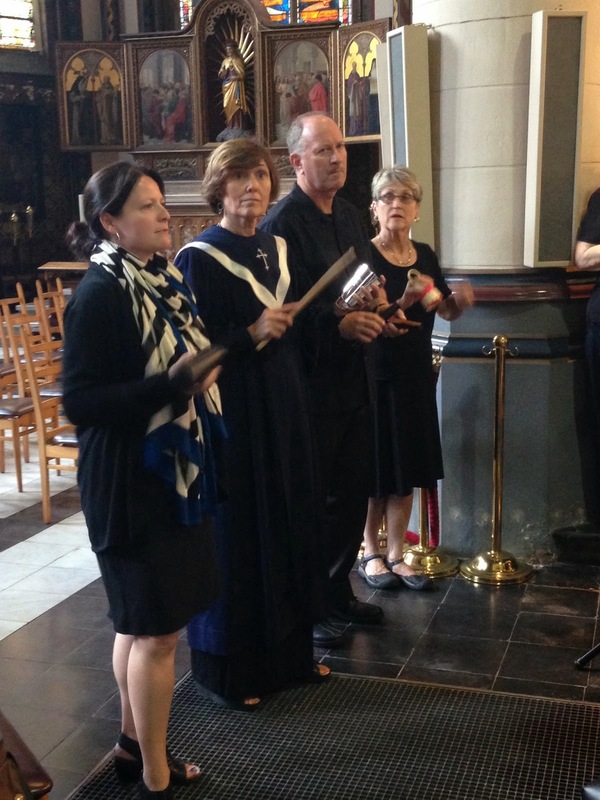 So through this connection, the choir was able to arrange a benefit concert for Serve the City to be given in nearby Bruges, Belgium as part of their choir tour. for a Serve the City (cool organization we helped connect them with) benefit concert! Whew, enough backstory for ya?! On to the rest of the 2014 photos! Later that afternoon we followed the choir out to the church for their rehearsal, stopping for photo-ops. Fortunately our kids are quite adept by now at sitting through music rehearsals! I told you there'd be cowbell! The concert began, and brought back so many memories! Not only did many of the same people from last time come on this trip as well, but they even sang a couple of the same songs we sang with them 9 years ago. We're so pleased everything worked out so we could do this together! 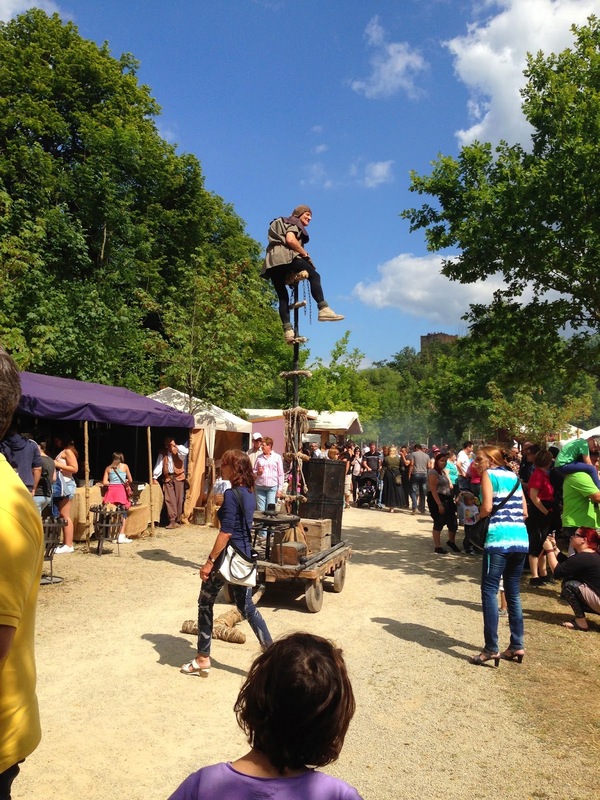 One thing we've learned since living in Europe is that where there are castles, there are medieval festivals. Because, why not? If you've got a castle, you might as well make good use of it. We decided to attend our very first medieval fest in Useldange this weekend, after hearing and reading that it's one of the better ones around. Although visiting this castle is free on a normal day, the festival was 5 Euros for adults, or 2 Euros if you came dressed in medieval attire. (I'll let you guess how much we paid). 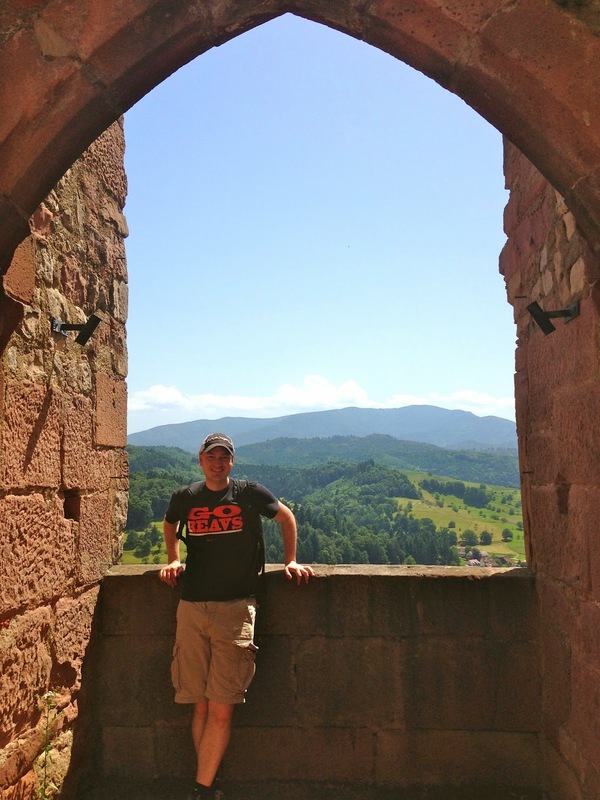 First, we climbed the castle keep, because we like climbing towers. Displays along the staircase had audio commentary in English, but we breezed on by, anxious to explore the festival below. So, the festival. I think we were expecting something a bit different, a bit more interactive, with perhaps a variety of simple crafts and activities for kids. 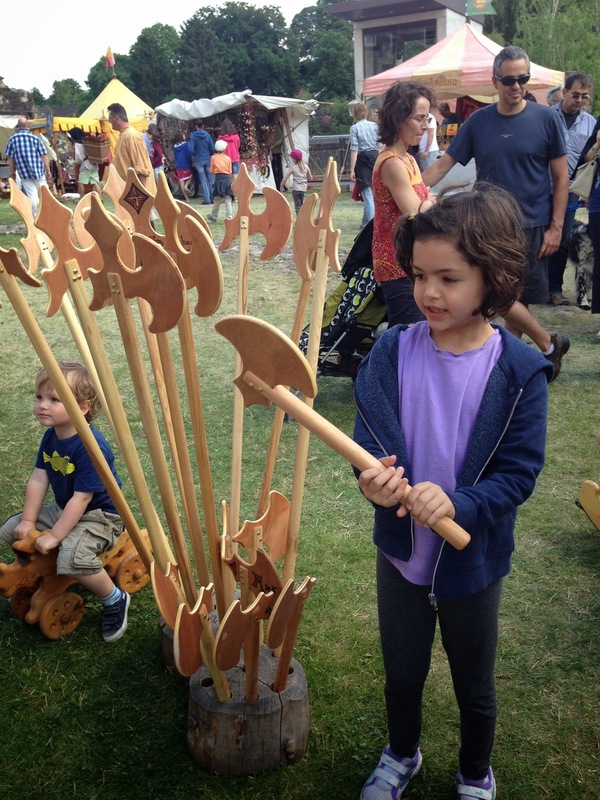 There were indeed a couple activities for the kids to try - working with leather, blacksmithing - but the attendants were busy, grouchy and frustrated, constantly stoping everyone to tell them they were doing it wrong. There were a few games to play, but 1-3 Euros for 10-20 seconds of game seemed a bit steep. This is the guy from the ad posters. I'm still not sure what he's doing or why he's doing it. or 6) wanted to spend a lot of money. I suppose you could think of the festival as "living museum" of sorts, except that for a living museum the proportion of stands with people selling things seemed entirely too large. Instead of just selling medieval headdresses and crowns and weapons, why not give people the opportunity to make a simple version of their own, even for a small fee? Anyway, by now you're probably thinking, "Well then, Miss Complainy-Pants, why don't you just make your own medieval festival and see how hard it is?" But really, it was fine. It was just a learning experience for our family: to not set our expectations for something when we've never actually been to one before, to have a good attitude and look for the positive side when our expectations aren't met, that our outings will be hit and miss as we try to get out and do more, that we probably aren't the target audience for a medieval festival, and that we prefer a nice visit to a castle ruin on a normal, regular old day. Nothing wrong with that. Pete found a well. You can tell he's impressed. So, in summary, it was a lovely drive out to a lovely castle on a lovely Luxembourgish day! Well, the Ts are in for a treat this month! Grammy and Grandpa are traveling in Europe with their church choir and have tacked on a couple visits to Luxembourg. They are currently here for 3 nights, and leave tomorrow morning to meet up with their fellow singers in Paris. 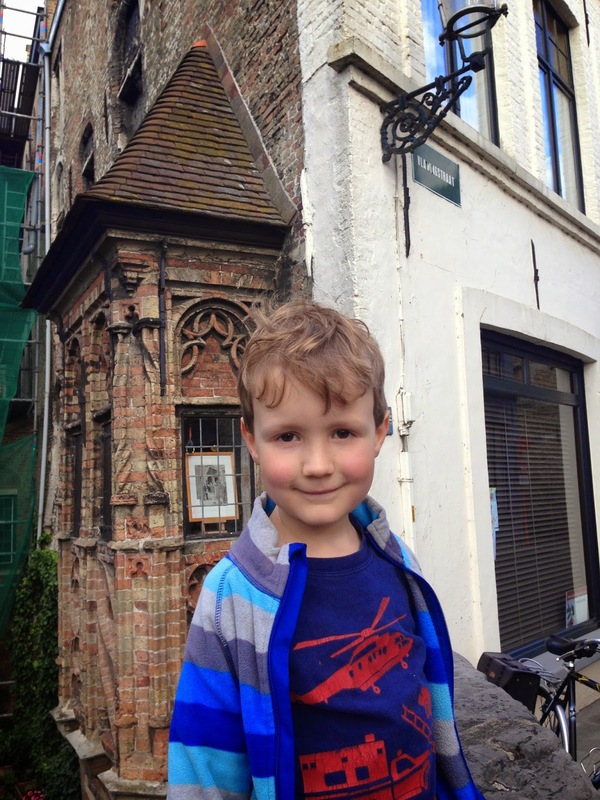 Then next weekend we will meet them in Bruges, Belgium where they will be giving a concert to benefit Serve the City. Lastly, they will come back to Luxembourg for a few days at the end of the month. We're pretty happy about this nice sprinkling of visits. 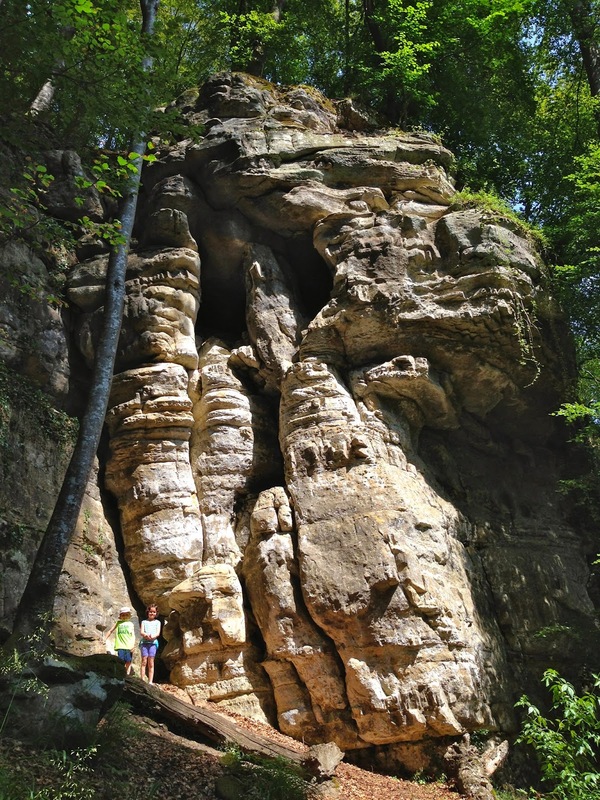 Yesterday we did a bit of hiking in Little Switzerland while Pete was at work. The kids and I are still off school for mid-term/Pentecost break. 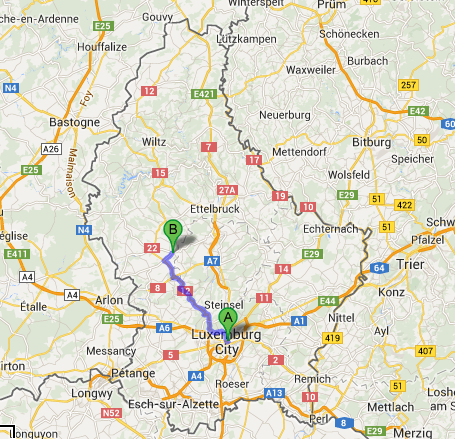 Then we drove a few minutes to the town of Echternach by the German border in search of ice cream. And we took a little walk around the city and near the river before heading home. They're off tomorrow morning, but we'll see them in Belgium! 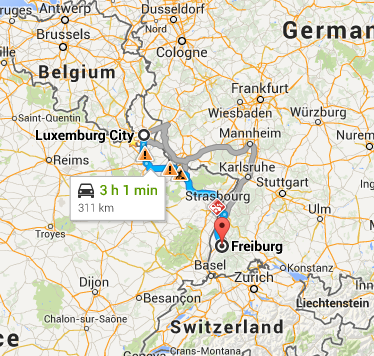 This weekend we drove to Freiburg, Germany (not to be confused with Friedberg, Germany, north of Frankfurt). 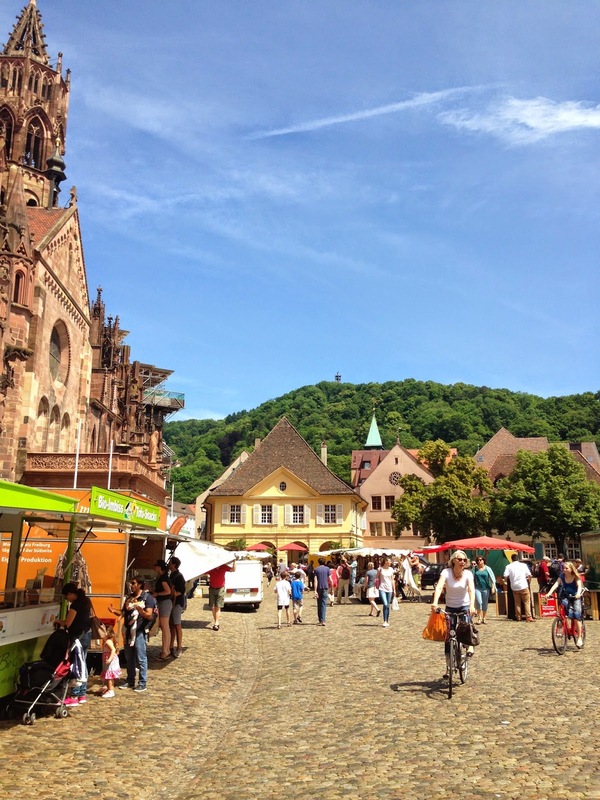 Freiburg is right across the border from Colmar, France in the Alsace region, and near the Black Forest. We were paying a visit to our American friends I met online last year through their expat/travel blog. 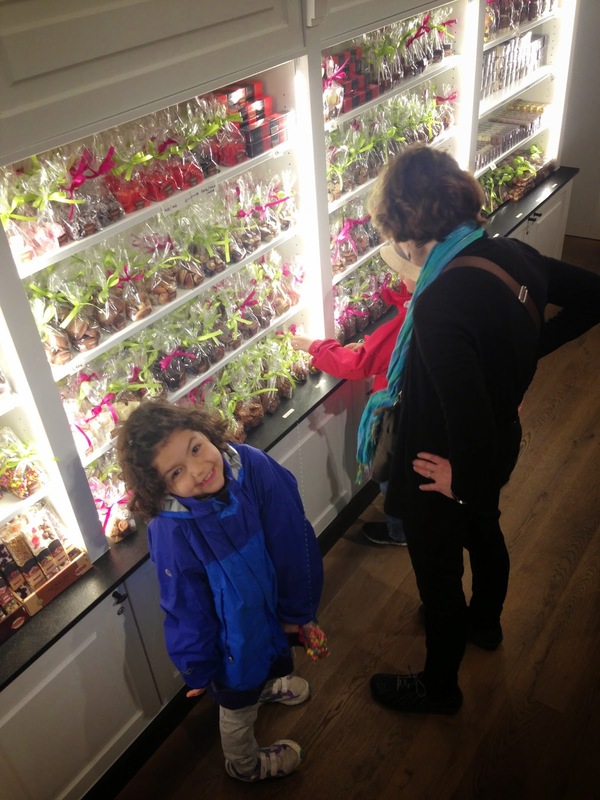 We hosted their family in Luxembourg for a weekend back in October. We stayed with their family of five in their cozy flat near the university where the husband/dad works. 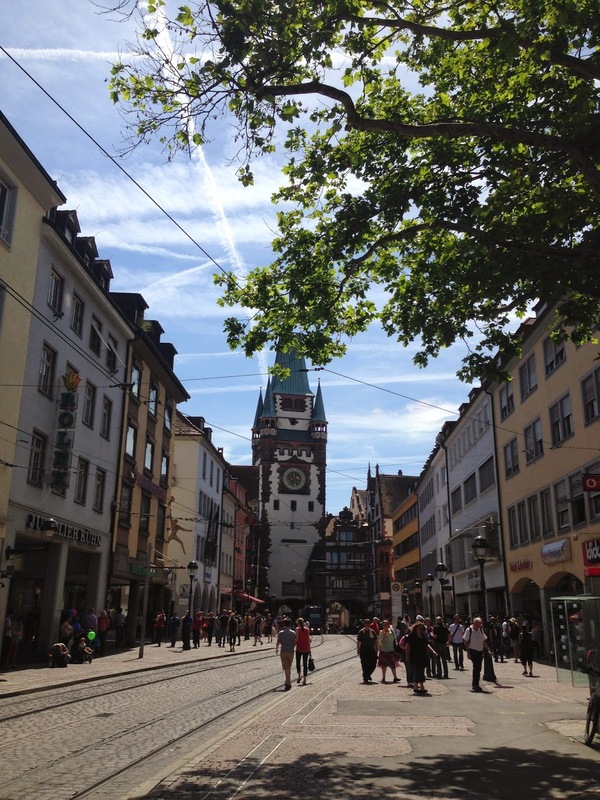 Freiburg is a cycling town, and our friends scored us enough bikes to all take a ride around the city and along the rambling country bicycle paths on Saturday morning. Pit stop. 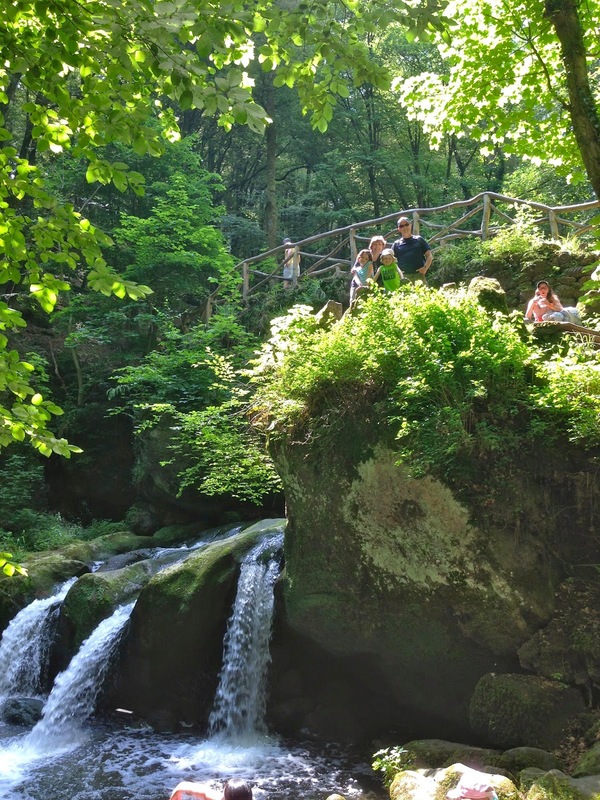 It was extremely hot in Frieburg (and Luxembourg) this weekend. Could it be that he was about to purchase Mexican food? Real, authentic Mexican food with ingredients sourced from actual Mexico and SoCal?! Yes, we're slightly obsessed with Mexican food (and even more so now that it's so hard to come by any that tastes quite right). Wow. Expectations met and exceeded. We'll be fantasizing about those burritos for awhile. Our tummies full and happy, we rode back home so the toddler could nap, and the rest of the boys and I set out to explore the center of Freiburg. It's a canal town - and can you spot the stone crocodile head? 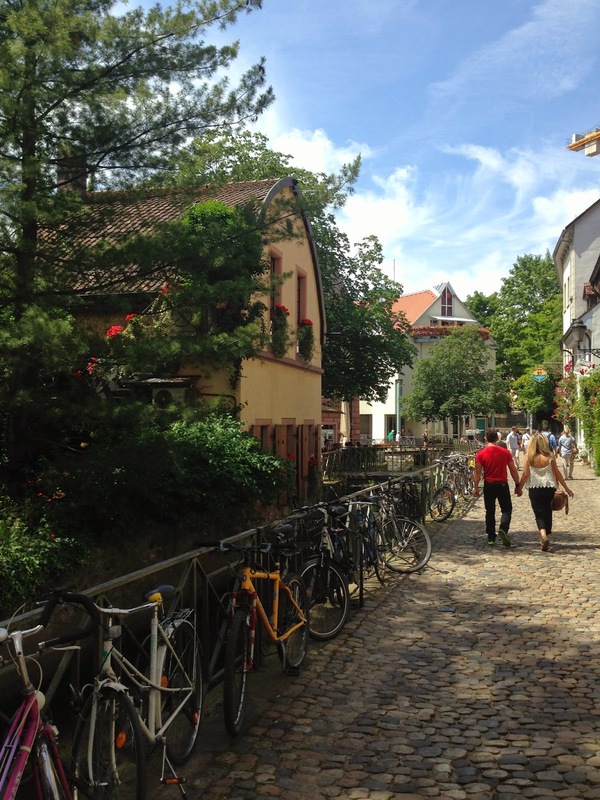 A unique feature of Freiburg is that in addition to canals, the old town streets have a network of mini canals. 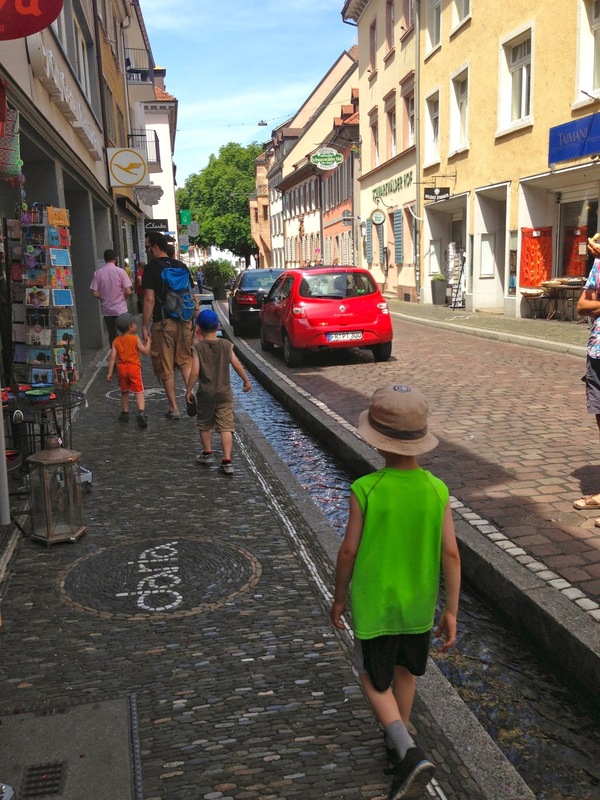 "The city has an unusual system of gutters (called Freiburg Bächle) that run throughout its centre. These Bächle, once used to provide water to fight fires and feed livestock, are constantly flowing with water diverted from the Dreisam. They were never intended to be used for sewage, and even in the Middle Ages such use could lead to harsh penalties. During the summer, the running water provides natural cooling of the air, and offers a pleasant gurgling sound. 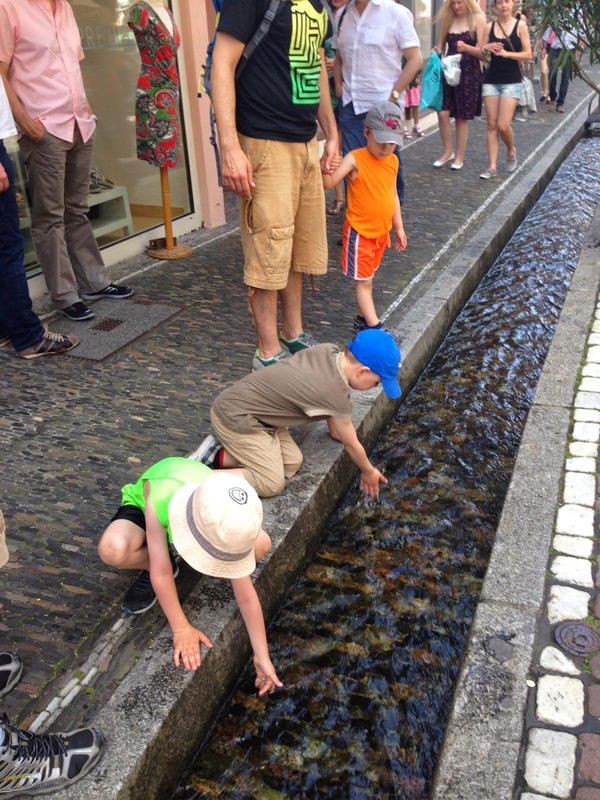 It is said that if one accidentally falls or steps into a Bächle, they will marry a Freiburger, or 'Bobbele'." Church square with daily market selling primairly all manner of Wurst imaginable. And more bikes. And our friends also introduced us to the Laugencroissant - a croissant on the inside and a pretzel-like coating on the outside. Yep, tastes as good as it sounds. On Saturday evening we headed out to the common lawn to barbecue amongst the university crowd. They introduced us to the fun game of Kubb. Might have to pick up a set ourselves! 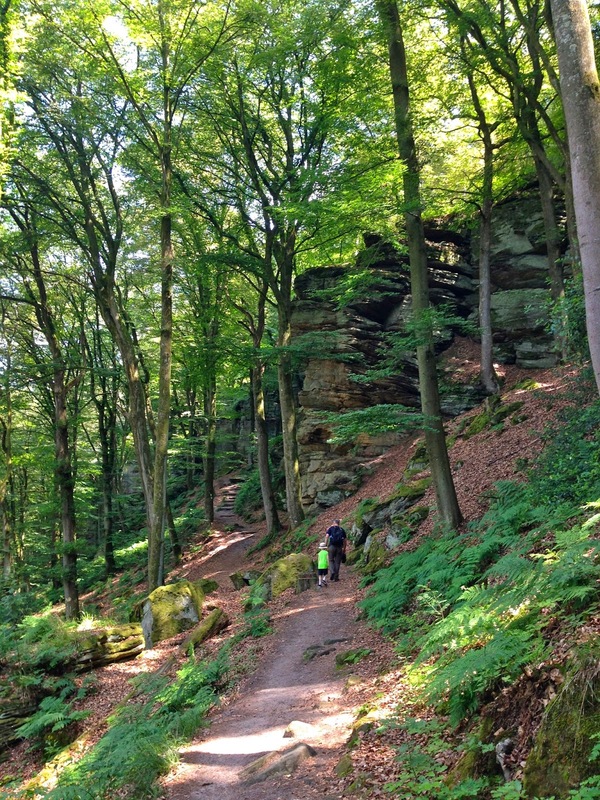 On Sunday we hiked out to a local castle ruin (Hochburg) for a picnic. And back at the bottom, we cooled our toes in a stream. Visiting friends or family is probably our favorite way to travel; it doesn't really matter where we end up, the location is completely secondary. And Freiburg friends, when you read this, please know that we like you more than Mexican food, and we'd have visited you, taco shack or no taco shack. We're just mildly obsessed. We know you understand, and that's probably part of the reason we're friends, right? 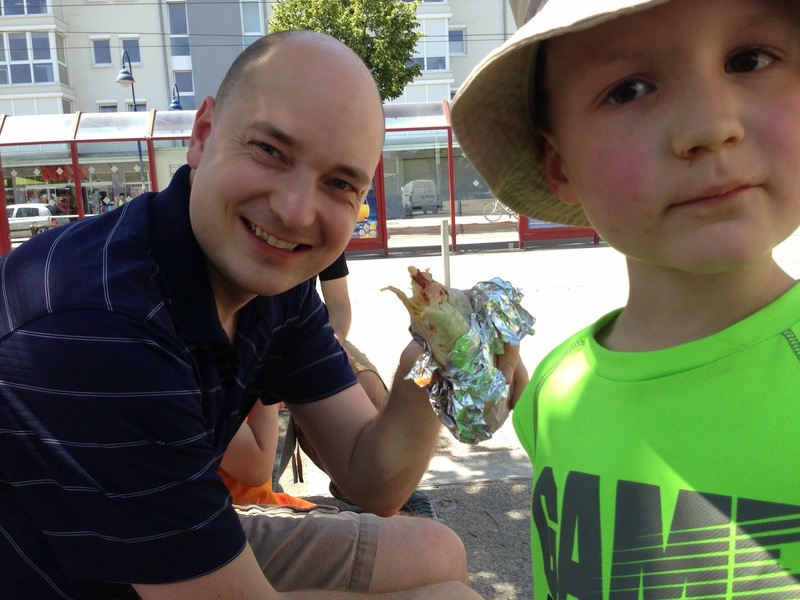 So we may be back for a burrito run-for-the-German-boarder sooner than you think!